The Defense Advanced Research Projects Agency (DARPA) manages high-risk high-payoff research projects for the Department of Defense. Such projects provide dramatic and game-changing advances for our warfighters, thus DARPA has a key role in the the Department’s science and technology system. This lecture will discuss DARPA’s work to prevent strategic surprise and create strategic surprise for our adversaries. 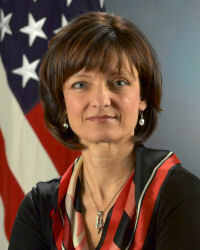 Appointed by Secretary Robert Gates, Dr. Regina E. Dugan has served as Director of DARPA since July 2009. She first served DARPA as a program manager from 1996 to 2000. At that time, she directed a diverse $100 million portfolio of programs including the “Dog’s Nose” program, an effort focused on the development of an advanced, field-portable system for detecting the explosive content of land mines. In 1999, she was named DARPA Program Manager of the Year for her efforts, and in 2000 she was awarded the prestigious Bronze deFleury medal by the Army Engineer Regiment. She is also the recipient of the Office of the Secretary of Defense Award for Exceptional Service.